Even in a world not yet ravaged by the undead, throwing knives are invaluable! No matter the issue at hand, be it the apocalypse or a friendly competition, the 2 Piece Biohazard Dark Strike Throwing Knives is sure to get you through! Both of these exceptional throwing knives host a classic spear-shaped blade crafted from blackened stainless steel that will stick to your intended mark as forceful as lightning. A blade-heavy design, complete with three cut-outs on each handle, enhances the forward rotation and precision, turning everyone into a professional with a bit of practice! Carved into the center of each knife is the iconic bright green biohazard symbol, a pop of color on the sinister silhouette. Tuck them away in the durable nylon sheath for safe keeping until the time comes to use them. 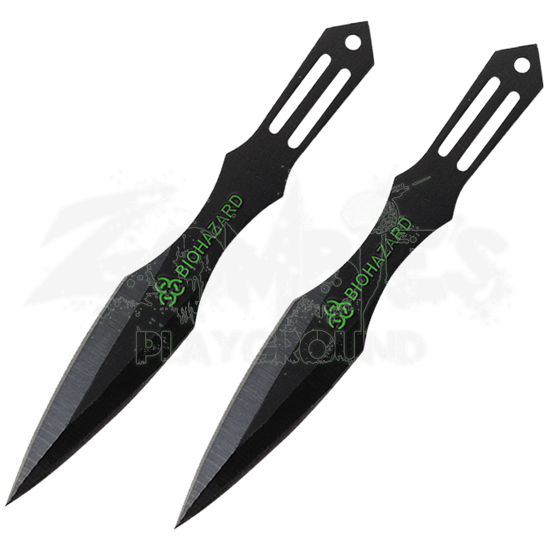 Zombie hunting and slaying the competition will be a piece of cake with the 2 Piece Biohazard Dark Strike Throwing Knives, the perfect on hand tools for a wicked good time!